Over the last few years, HP has been working on rebuilding a reputation for high-end laptops. And, since then HP laptops have experienced a renaissance through the magic of Ultrabooks running on Windows 10. The best HP laptops, then, have transformed into gorgeous pieces of kit that focus on design flair, rather than cheapness. HP’s recent moves have resulted in some of the most gorgeous laptops we’ve ever used, like the new HP Spectre x360 2019, with its gold trim and high-resolution displays. And, it doesn’t seem like HP is slowing down any time soon, judging by its CES 2019 announcements. This resurgence has also brought about the popular ‘privacy filter,’ called Sure View to prominence. Plus, the best HP laptops are bedecked with a beautiful gold trim that we’re used to seeing in HP’s high-end Spectre 2-in-1s and Ultrabooks. The HP Spectre x360 has always been one of the best HP laptops, but the 2019 refresh sees an elegant redesign that takes it to the next level. This gorgeous gem-cut laptop will draw jealous looks at whatever coffee shop you work in, while the powerful hardware will make quick work of anything you throw at it. It’s easy to see why this is one of the best HP laptops you can buy today. The HP Spectre 13 is straight up one of the most gorgeous laptops we’ve ever used. The ceramic white finish is beautifully topped off by a two-prong hinge design that’s extremely attractive. But, the Spectre 13 goes even further, by packing some serious horsepower. It leverages the power of 8th-generation Intel Kaby Lake Refresh processors to outpace the competition. The HP Spectre 13 is one of the best HP laptops, and will let you get all your work done in style. While it doesn’t redefine the PC like HP’s marketing claims, the HP Spectre Folio does enough right to be one of the best HP laptops you can buy. Covered front to back in leather, this 2-in-1 laptop is aimed directly at the luxury market, with a price tag to match. It’s not the fastest laptop out there, but the fanless chip on board has enough juice to get through most everyday tasks, just don’t expect to get any serious video editing done. This is more for the professional taking a device between meetings. The HP Pavilion 15 isn’t going to blow your mind with sheer power, but it will make up for it with finesse. It’s one of the few remaining AMD Ryzen-based laptops in HP’s stable – which could change – but the Ryzen chips here are worth paying attention to. 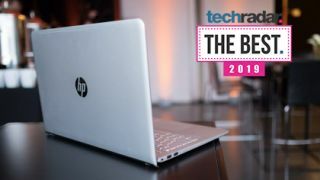 This is the best HP laptop for anyone on a budget, it's a rare example of a laptop that can strike a golden balance between price and performance, making it one of the best laptops for college students. If you’ve been watching the laptop market as long as we have, you’ll have noticed that the best gaming laptops kind of get a bad rap, thanks to the lack of mobility. However, HP has addressed this issue by adding plenty of new features that gaming laptops tend to lack. First, you can overclock the Omen X, which just means free performance – which will keep it at the top of the stack longer than competitors. For gamers, the HP Omen X is a no-brainer. HP’s flagship Spectre line of Ultrabooks and 2-in-1s might get all the hype, but the manufacturer has a long-running tradition of crafting some of the best business laptops. The HP Elitebook continues this tradition by packing in powerful Ryzen processors, plenty of memory and speedy SSDs beneath a svelte all-metal chassis. It is a bit expensive, but if you’re looking for an office laptop, with all the requirements that business-grade products require, this is the best HP laptop for you.